PS ~ Sorry for lack of screenies, but most of this work wasn't amenable to it. Wot 'u talk'n' 'bout Willis? In all seriousness. frakking woo! Secondly... October 4th?! Wow! Back to the future!!! (Calmly) Yes, I am fine. It is fine. Everything is fine. OK, fine, but will you hire me? Can I have like a dozen helpers to get all these ideas out of my head before it explodes? After you're filthy rich of course, so... July? This, right here, is exactly what I'm looking for. I'm genuinely overjoyed to hear you say this. I want to see the sort of mods that you make after limit theory, the kinds of mods other people on this forum make, the kind of mods I make. I want to see what people of all ages, people in Senegal, Sri Lanka, South Korea and South America do with this. In the next few years, billions of people will come onto the internet for the first time, and I want them to enjoy, and contribute to, what I foresee to be countless communities built around letting anyone and everyone build their own games and worlds in the engine you developed. That's a long way off, but from what you're saying here, it sounds a LOT closer to reality than if you had stuck with your original idea of non-moddability, releasing a good, but niche game. Now, that said, consider this: Can I import external file types, perhaps convert them into something for LT, like a jpg, animation, sounds, etc? Can I create Probabilistic manually defined objects/scenarios/empires/etc. Which definitely exist somewhere in the infinite universe, but where exactly? The seed decides. Can I create the solar system, complete with imagery of the planetary surfaces? Can I create Asimov's Foundation? Can I create asteroid Tetris and have the npcs play it? Josh, I heard this in my head as I read your soliloquy. In answer to this, I would say "almost certainly yes" to all of the above except animations, although the LT Tetris might be a bit weird. 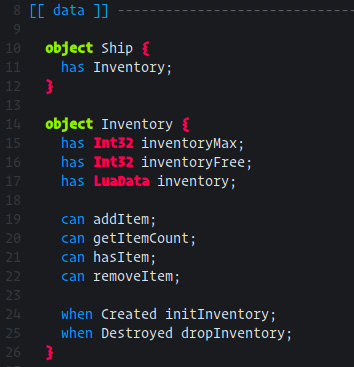 With most of the gameplay code in LUA, modding becomes quite simple, given enough hooks. 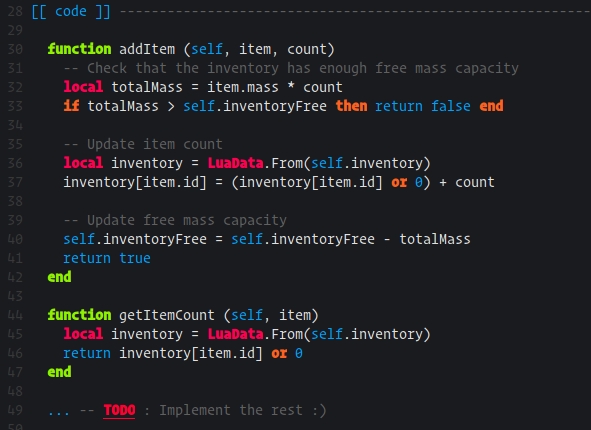 I am not massively familiar with lua, but it looks very simple. Im game. Beats Java. Wait is this the part where you Github the project to only backers and use version control so that they can all contribute to end game gameplay code? Mods included in initial release? Keep the source C++ secret and just release the Lua? Even if wrong, I regret nothing. It's a worthy goal to aim for.